The term dry tropical forest can be misleading, because it includes such stands as dry deciduous forests, thickets, open woodlands, savannas and steppes (wooded, tree and shrub). To define the dry tropical forest, authors use such differing concepts as the structure of the vegetation, its appearance, the amount of sunshine, rainfall, evapotranspiration, and the number of dry days or months - and even these are defined using different criteria. Generally speaking, the terms used by different authors, whether they are foresters, botanists or geographers, derive initially on borrowings from the local languages or dialects. In the second stage, the scientists become more consistent and propose classifications which apply world-wide. According to FAO terminology, forests include closed forests, as well as open woodlands and savannas with at least 10 percent tree cover. In Table 3, the two left-hand columns are regarded as landmark in the world of forestry. Despite its shortcomings, Yangambis classification (Aubréville, 1957) is the result of a consensus between a large number of French-speaking and English-speaking plant geographers. Moreover, the terms used are straightforward and full of imagery. They have been whenever feasible, related to the FAO 1981 classification. The heavy outline in Figure 1 shows most of the natural, woody-vegetation stands studied in this document. This section describes, in very general terms, the main types of vegetation considered in this paper, including dry deciduous forests, thickets, open woodlands, savanna and steppes. The definitions and Figure 2 are taken from Letouzey (1982). This type of forest is one of the rare, closed forest formations (with thickets) examined in this study. It is a closed stand, with no substantial opening in the crown cover (above 80 percent), the trees are approximately 15-20 m high and they lose their leaves, with few exceptions, during part of the year. The understorey comprises sparse and scattered evergreen or deciduous shrubs, with a few grass tufts. In Africa this formation is only found in the relics of degraded forest stands in the Sudanian domain running from Guinea-Bissau to the Central African Republic. It is also found in the Zambezian domain, which is on the extreme edge (humid) of the area covered by this paper. The stands are still substantial in Madagascar, where they are located to the west and south-western parts of the island with very different specific flora from elsewhere in Africa, and where the trees are not more than 15 m high (Figure 2). 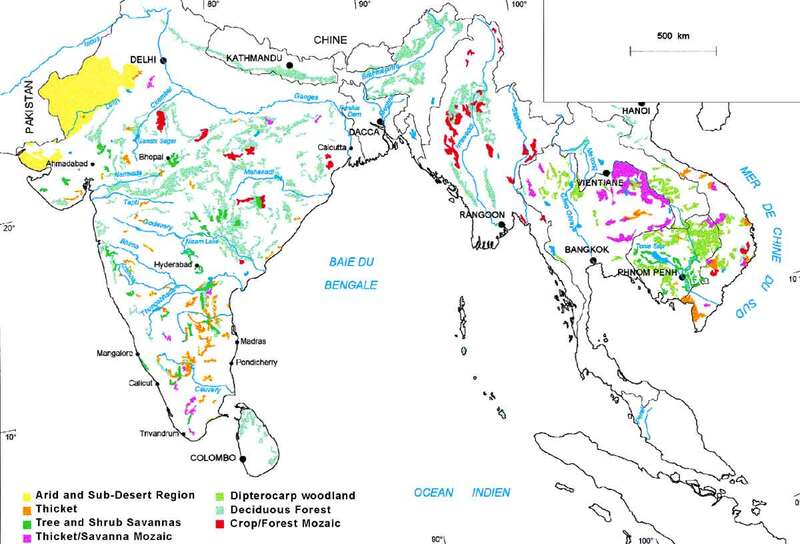 In Asia the dry deciduous forests are found in India, in the north-eastern part of the Deccan Plateau (the Shorea robusta forests, with annual rainfall ranging between 1,000 and 1,600 mm, average 20 m high) and in the west (the Tectona grandis and Anogeissus latifolia forests have lower annual rainfalls, but are the same size as the Shorea robusta forests, though they can reach a height of around 40 m in certain parts). In America, along the Pacific Coast of the Central American isthmus, this type of formation is represented by fairly small forests such as the Selva baja caducifolia. There are also a few stands in Venezuela, Colombia and particularly in the heart of Amazonia (the Santarem region). These are closed, dense formation with crown cover density in excess of 80 percent, comprising only suffrutescent plants and shrubs, both evergreen or deciduous, which are generally difficult to penetrate, and do not exceed 8 m in height. There is little or no grass cover. These are generally edaphic formations, mainly found in Africa and South America. Examples are the climbing acacia (Acacia ataxacantha) thickets found in clay depressions, or various Combretum spp. stands in the Sahel, Bussea and Pseudoprosopis stands in Tanzania and the xeromorphic Ruprechtia triflora thickets in Paraguay. These are open forest stands with small or medium size trees, and whose crowns are almost continuous, but through which light is able to penetrate widely. They have partial grass cover and the tree layer is virtually continuous (10-20m and 40-60 percent cover). The species are very gregarious, which differentiates these forests from the tree savannas. Nasi (1994) sets these apart by the fact that they are highly characterized by an Rl/h ratio between the woody biomass and the herbaceous biomass (open forests Rl/h ³ 3, tree savanna 1 £ Rl/h £ 2). These vegetation formations are often overharvested as a result of overgrazing associated with fuelwood extraction and crop farming, as evidenced in northern Cameroon in the new cotton fields. In Africa, in the Sudanian domain (Map 4) these are mainly made up of Isoberlinia and Uapaca. In the Zambezian domain they are much more developed, mainly the miombo forests comprising the Brachystegia, Isoberlinia, Julbernardia, Parinari and Uapaca genius, and the mopane forests composed of Colophospermum mopane and Acacia genius. In Asia, the open Dipterocarpaceae woodlands (Dipterocarpus alatus, D. obtusifolius, etc.) are found in Cambodia, Laos, Thailand and Myanmar. Their grass cover is continuous. The teak forests (Tectona grandis) in the dry areas of India are also open woodlands, as are the Hardwickia binata transitional forests to the Deccan thorn series. The savannas comprise continuous grass cover mainly made up of hardy grasses (graminaceae) and trees or shrubs, varying in density, frequently with twisted stems. In some depressions, the trees are sufficiently close to be considered open woodland. Open woodland, savanna woodland and tree savanna lie on a continuous scale, which explains why some stands, such as the miombo forest and mopane forest, are classified by some authors as savanna and by others as open woodland. Generally speaking, one might consider that in open woodland the grass cover is strongly influenced by the woody layer, whereas in the savanna the trees only have a local influence over the grass cover, mainly under the crowns. In a similar, but more quantified way, one shall speak of woodland when the Rl/h ratio between the woody biomass (1) and the herbaceous biomass (h) exceeds 3, and use the term tree savanna when l < Rl/h < 2 and shrub savanna when 0.5 < Rl/h < 1 (Nasi, 1994). In Africa, and particularly in the Sudanian domain (Map 4), examples include the Anogeissus leiocarpus savanna woodlands which make place in the north, to the Sahelian-Sudanian biogeographic zone, dominated by tree savanna (Khaya senegalensis, Parkia biglobosa, Butyrospermum paradoxum and various Combretaceae). In the Sudanian and Sahelian domains tree savannas gradually gives way to the Combretum micranthum, Sclerocarya birrea, Acacia seyal savannas. Further north, in the Sahelian domain stricto sensu, the latter give way to Mimosaceae (Acacia senegal, A. raddiana), Balanites aegyptiaca, Commiphora africana, Boscia senegalensis savannas and steppes. In America, Krameria and Salvertia savannas are found in the Brazilian cerrados where the twisted trees, between 4 to 8 m high, grow fairly close, and in the South American campos. In Asia, in the central Indian regions, there are the Albizia amara, Acacia, Capparis, Anogeissus, etc. savannas. These are open, herbaceous formations with discontinuous grass cover, mainly annual species, and sometimes with woody plants. The woody component is fairly sparse and less than 10 m high. Usually a distinction is drawn between tree and/or shrub steppes, thorny shrub steppes, and dwarf-shrub steppes. They are found in the drier areas, bordering the deserts (Sahara, Kalahari, Thar). The succulent, herbaceous and/or graminaceae steppes are not considered in this study. 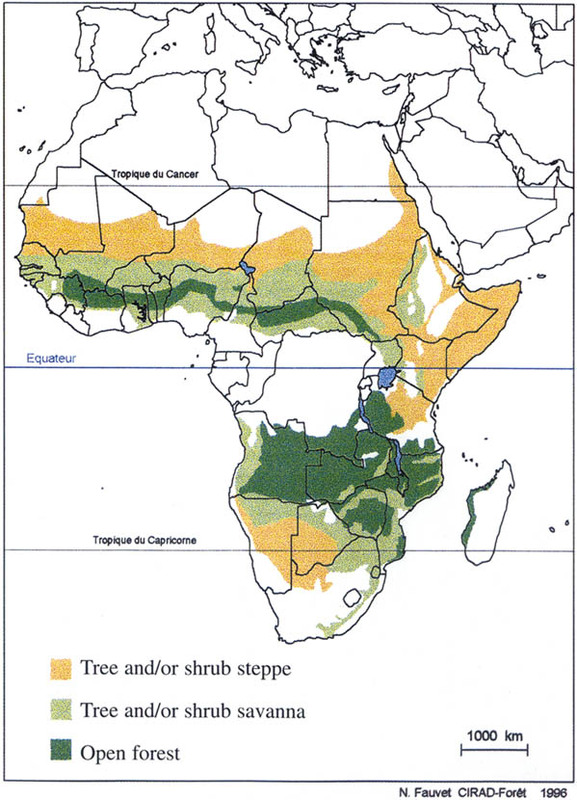 In Africa, in the Sahelian domain, particularly with a Sahelian-Saharan climate, the steppes found are Acacia tortilis ssp. raddiana, A. senegal, A. ehrenbergiana, Balanites aegyptiaca, Calotropis procera, Leptadenia pyrotechnica steppes. In Central America, the Prosopis juliflora mezquital and the matorral, which is characterized by Cactus (Cereus, for example), may also be considered as steppes. In Brazil, the caatingas with Aspidosperma, Piptadenia, Pithecelobium and Zizphus are also steppes as are certain parts of the Chacos in Paraguay, Bolivia and Argentina. In Asia, in north-west India, one could cite the Prosopis, Acacia, Ziziphus, etc., stands. It is interesting to compare fairly similar stands spread throughout different continents. One such comparison between the African Sahel and the Brazilian Sertão is described in Box 1. In the Sahel (northern hemisphere) the short rainy season generally runs from late June to September. The rain falls exclusively in the hot season. Rainfall variations are considerable and the mean annual temperature range between 27.5 and 30°C. The semi-arid zone of the Sertão (southern hemisphere) has two different rainfall regimes: in the north, the rainy season is mainly in March, whereas in the south it is concentrated in November, December and/or January. Rainfall coefficient of variation reaches 50 percent, which is much higher than in the Sahel. Conversely, the alternation between the two seasons, dry and rainy, is not regular. Rain in the Sahel is far more erosive than in the Sertão. Average solar radiation, while being high, is still lower than in Africa. The Brazilian caatinga is a low and dry forest in the full sense of the term, between 2 and 5 m high, continuous and often dense, (with a 90 percent tree and shrub cover in the semi-arid zone of the three north-eastern states (Pernambouc, Paraôba and Alagoas) with sparse grass cover and dominant woody legumes. The tree and open shrub savanna and the striped bush (brousse tigrée) in the Sahel are very largely made up of a grassy layer which becomes rapidly parched after the rainy season. Under comparable rainfall conditions, the woody-vegetation densities and biomass are, respectively, in excess of 17 000 individuals/ha and 23 t/ha in the caatinga, compared with 133 individuals/ha and 1.8 t/ha in Senegal. The low and extremely variable rainfall prevents a sufficiently large and regular annual food-crop harvest. In both cases, the impoverished rural people are forced to practise subsistence farming with a very low technological level, extensive livestock farming and to migrate to the towns. Both regions, which are essentially rural in character, have the same average density of 16 inhabitants/km2. In dry Africa, extensive, manual agriculture is practised in the traditional manner. It is common to burn the fields before cropping each year, and to practise mono-cropping. Transhumant livestock husbandry is practised mainly by the Peuhls. In the Sertão, crop and livestock farming, which are sedentary activities, complement one another on clearly defined private land. The most common cropping practices are ploughing by hand or with light animal traction, along the steepest slope and associated cropping. The fields are rarely burned, and it is not an annual practice. The soils in the two dry regions studied here which originated from identical rocks on the same original crystalline base, and on different sedimentary rocks, are morphologically similar (vertisols, brown soils, solonetz, rendzines) or morphologically close (latosols-ferralitic soils, regosols and poorly-developed litholitic soils, and lithosols) and morphologically different (podzolic, tropical ferruginous, cambisols and brunizens). In north-east Brazil the relief is more rugged and makes it possible in part to appreciate the higher level of underground drainage of the internal solutions of the soils in this region. The Sertão soils allow much more infiltration than the equivalent soils in Africa, and the storm water is more heavily charged with dissolved salts. Conversely, rain-water running off the impervious crusted sandy clay horizons, which infiltrates in slight amounts the poorer soils impoverished with alterable minerals and the deep de-saturated altered Sahelian layers, are low in mineral content. 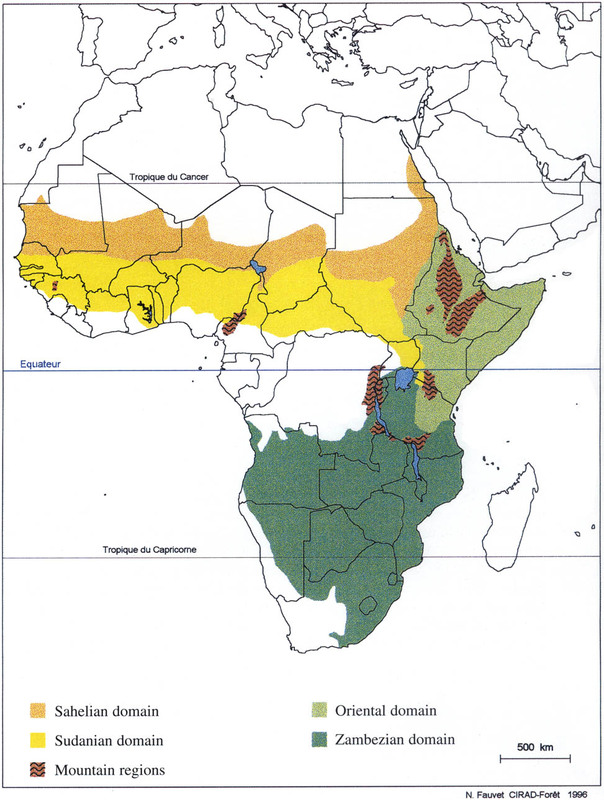 The dry zones in West and Central Africa, to use Whites terminology (White, 1983) comprise the Sudanian Regional Centre of Endemism covering an area of 3.7 million km2, and the Sahel Traditional Zone which covers 2.8 million km2. The first zone is dominated by open woodlands and their degraded patterns. The second is mostly steppe vegetation, with a variety of trees, and thorny bush cover. These woody stands without a grass layer only exist in the form of a few relic stands on sites protected from forest fires and degradation of anthropogenic origin. There are four types of stands of this kind. - forests where legumes predominate (Pterocarpus erinaceus, Parkia biglobosa, etc.). Legume forests: These formations formerly covered vast areas under the Sudano-Guinean climate (Aubréville, 1949). Today, they have become open woodlands or savanna woodlands, and are often mixed with Isoberlinia doka open woodlands, which are described below. The five main species are legumes, sometimes mixed with Anogeissus leiocarpus, varying in height 10-20 m: Tetrapleura schweinfuthii, Burkea africana, Erythrophleum africanum, Prosopis africana and Daniellia oliveri. The semi-evergreen underbrush is very fire-sensitive in the dry season. All the species found in these forests are also found in the savanna woodlands and open woodlands. The Anogeissus leiocarpus forests: This species of the Combretaceae family covers an exceptionally large area in boreal Africa, from Senegal to Eritrea. It has a remarkable ecological amplitude. It runs from the edges of the closed rainforest to the semi-arid zones. In the Sahel, this species is confined to cool/moist soils (swamps and temporary waterways), but in the less dry regions Anogeissus forms forests where it prevails mixed with Isoberlinia or with the aforementioned legumes. These are closed forests with a thick shrub underbrush. The optimum conditions for these formations are those with the most humid features in the Sudanian domain (rainfall: 1,400 mm/year). These Anogeissus fire-sensitive forests have been very largely destroyed or degraded. - Gilletiodendron glandulosum forests, which are still found in the ravines on the Mandingue Plateau near Kita (Mali). - Guibourtia copallifera forests, which are found scattered between Senegal and Cameroon. These forests are generally found near sandstone plateaus (Mandingue Plateau, Bamenda Plateau, sandstone massifs in Upper Guinea, etc.). - Khaya senegalensis and Cola cordifolia forest in Casamance, which is rich in legumes, but has been very largely destroyed by fire and clearing for agriculture. According to Van den Berghen (1984) there are only a few relic stands left in the Kalounayes forest, generally covering less than 2 ha in size. A similar forest has also been described by Adam (1968) in the Niokolo-Koba Park (Senegal). NB: The Cailcedrat, Khaya senegalensis, is a very valuable mahogany tree which is found everywhere, both in the dense formations and the open forests in the Sudanian domain, from Senegal as far as Sudan and Uganda. This tree is indeed typical of the dry zones of Africa. It is sometimes found isolated in savanna woodlands, but also in gallery forests and in closed forest stands. In West Africa it can be found abundantly, from the savanna to the semi-moist forests. Cailcedrat generally dominates the other trees. On deep soil it can reach a height of 25-30 m and on light dry soil its bole is shorter but can still be extremely large in diameter. This is one of the most characteristic (and sought-after) trees in the Sudanian landscape. - galleries or riparian strips which colonize the banks of the backwaters in the northern part of the Sudanian Regional Centre of Endemism are characterized by species which are not riparian at all, but savanna or open woodland species that migrate towards the lower bed as the rainfall progressively declines - Bombax costatum, Daniellia oliveri, Diospyros mespiliformis, Lannea microcarpa, etc. Open woodland comprises many forest stands whose crown cover density is more or less important, depending upon the impact of human interference. The different degrees of openness or degradation are similar in terms of the flora, and comprise a comparatively small number of species such as: Detarium senegalense; Daniellia oliveri; Dialium guineense; Afzelia africana; Pterocarpus erinaceus; Isoberlinia doka; and Khaya senegalensis. The open woodland therefore comprises a number of plant profiles, running from the virtually completely closed forest with a thin grass cover to tree savanna or shrub savanna and whose flora has been, thanks to the ancestral practice of burning, reduced to a very small number of species which have become fairly fire-tolerant. These are known as fire-resilient species. This adaptation/selection phenomenon is all the more striking that in the event of temporary or permanent protection of degraded zones, the vegetation recovers with surprising vigour tending to reconstitute an open woodland known as a closed climax forest. Thus the open woodlands with legumes or with Anogeissus leiocarpus are actually derived from the dry deciduous forests of the same type as those indicated earlier. The most noteworthy case is the Isoberlinia and Uapaca forest, or the Sau-Somon forest, which make up the finest stands in the Sudanian zone. The Isoberlinia doka open woodlands constitute a large almost uninterrupted strip from Mali to Uganda (following a gradient of annual rainfall exceeding 900 mm). In terms of the flora, these are the northern counterpart of the Zambezian African miombo forests. Even though Isoberlinia doka is a characteristic species in these stands, it is not always markedly dominant. It is often associated with Uapaca togoensis, Daniellia oliveri, Burkea africana, Erythrophleum africanum, Butyrospermum paradoxum, Diospyros mespiliformis, etc. In structural terms, these are mixed, woody and herbaceous formations with maximum heights ranging between 12-18 m, whose woody cover often exceeds 50 percent. The grass layer is very largely dominated by large hardy grass species which are shade-loving or mesophilic, such as Andropogon tectorum and Beckeropsis uniseta. In the non-degraded zones, these stands colonize virtually all types of soil except the flooded areas, and the outcrops. Unfortunately, the intact forms are becoming increasingly rare, and very often all that one finds today in place of these open woodlands is a wide open savanna landscape with a few more dense relic bocages. The most beautiful of the Isoberlinia doka formations are found mostly in Upper Guinea in the very sparsely populated areas in which river-blindness is endemic. There are also some fine stands in northern Côte dIvoire (the Odienné, Korhogo region), extended by less abundant I. doka formations in Ghana. In the north of Nigeria there are also some very extensive stands that are the extension of smaller ones in central Togo and Benin. In Cameroon the I. doka open woodlands were probably at one time the dominant plant formation in the Adamaoua and Mandara Mountains, which today support only highly degraded forms. Further up, they extend very widely into southern Chad, the Central African Republic, and southern Sudan (Bahr el Ghazal). - Legume open woodland in Senegal, often dominated by Pterocarpus erinaceus and Daniellia oliveri. The dominant height varies 15-20 m, with over 80 percent of woody cover in the best developed forms. - The Combretaceae-Leguminosae open woodlands which must have been the climax forests in the areas lying between isohyets 900 and 600 mm. The most frequent species are: Acacia sieberiana, A. polyacantha, Anogeissus leiocarpus, Combretum nigricans, C. glutinosum, and Terminalia spp. The vegetation rarely exceeds 10-12 m in height. The few species exceeding this are often the following: Bombax costatum, Pterocarpus erinaceus, Anogeissus leiocarpus, and Diospyros mespiliformis. These formations, deriving from the degraded open woodlands which are often kept in their present state by bush fires, are by far the most common in the whole of the Sudanian Regional Centre of Endemism. They are characterized by a continuous layer of heliophilous grasses of the Andropogonea group (Andropogon chinensis, A. gayanus, Schizachyrium sanguineum, Diheteropogon amplectens), covered by an open woody layer. Their crown cover, which rarely exceeds 15 percent, is made up of the most tolerant open woodlands species, such as Burkea africana, Combretum spp., Terminalia spp., Pterocarpus erinaceus, Bombax costatum, Daniellia oliveri, etc. Box 2 deals specifically with one particularly widespread genus in the savannas and steppes: Combretum. The edges of the swamplands and the banks of the temporary waterways are generally colonized by Mitragyna inermis, accompanied by Acacia nilotica and A. seyal. This is the most common vegetation on sandy soils. It is characterized by a very open bush or tree layer, often thorny, over a discontinuous cover of annual grasses (Cenchrus biflorus, Aristida spp., Schoenefeldia gracilis, Eragrostis tremula, etc.). - in the northern part (rainfall < 250-300 mm): mostly the same species, accompanied by Acacia tortilis, A. erhenbergiana and Leptadenia pyrotechnica. The genus Combretum is very plentiful in tropical countries, particularly in Africa. It comprises approximately 370 species of which 300 are in tropical and southern Africa, some 5 species in Madagascar, 25 in tropical Asia and 40 in tropical America. It is absent from Australia. In West Africa, the arborescent Combretum are all found in the Sahelian steppes and in the Sudanian and Guinean savannas. There are practically none in the closed woodlands. In practice it is possible to recognize Combretum immediately in the savanna on account of its simple, opposite or vertical leaves, and by its strange dry fruit with four membranous green-brown or reddish wings. While this genus is very easy to identify, the species are often very difficult to name. The difficulties are due to the wide variations in the habit, shape and size of the leaves, the pubescence, etc. These variations are mainly due to the effect of their abnormal life conditions. Few of the Combretum in the savanna woodland regions reach normal development. Generally, these shrubs come from stump sprouts. Each year, they are partially burnt by bush fires. After the bush fire period, they regrow quickly, but the leafy or blossom-bearing branches they then produce may differ from what they would normally be at the normal climatic time of resumption of vegetation growth. Furthermore, the bush fires may be early in the dry season, or late. The shape of the shoots differs as a result. After savanna fire, the trees acquire their new leaves fairly quickly. Most of them blossom at the same time. The samples that can be collected in this period are therefore young twigs, often bearing blossom. There are no leaves or fruits remaining from the previous year, as they have either fallen off or been burnt. In the case of the Combretum there are very considerable differences between the shape of the young leaves and the adult leaves. This explains why, one may be tempted to consider that we are dealing with two different species, while in reality, these represent two development stages of one and same species. Some of the Combretum in West Africa are distinctly Sahelian, while others are more Sudanian or Guinean. Around the rim of the Sahara, C. aculeatum appears to be the northernmost species. On the sands of the Sahelian zone it is Combretum glutinosum that dominates. In the Sahelian-Sudanian zone there is an abundance of C. nigricans var. elliotii and C. micranthum on clay-sand or lateritic soils. The Sudanian domain is the place where all these same species are found combined with many others such as C. ghazalense, C. geitonophyllum and its crotonoides variety, C. hypopilinum, and C. nioroensis. There are also others, but these seem to have more affinities with such Guinean species as C. aff. collinum, C. velutinum, and C. lamprocarpum. Gregarious species are quite rare. Only C. nigricans var. Elliotii, C. micranthum, and C. glutinosum are found, particularly in the Sahelian-Sudanian domain in large and sometimes almost pure stands. Other species are normally found in isolation or in small clumps. The West African arborescent Combretum are shrubs and small trees. Some individuals occasionally have the appearance of large savanna trees reaching up to 12-15 m high. This is the exceptional case of a few C. glutinosum which do not normally exceed 8 m in height. The species which can occasionally provide fairly tall trees are C. ghazalense and C. velutinum. Conversely C. micranthum, C. aculeatum, C. nioroensis are always only dwarf shrubs or climbers. Over about 40 years, the forest cover has certainly shrunk (as in Madagascar) and the areas dating back to 1949 (Map 3) must be taken with great caution, particularly with regard to the density of cover. - The Brachystegia and Isoberlinia forests, or miombo forests are the largest, characterized on a regional basis by the marked predominance of one or two Brachystegia species mixed with a dominant species of Isoberlinia; ... they are only found on eluvial or colluvial soils, and never on alluvial soils. Generally speaking, the finest stands are 15-18 m high, with 60-120 trees over 30 cm in diameter per hectare; the most mediocre have an average height of 10-14 m, comprising 15-80 trees of more than 30 cm in diameter per hectare; in very dry sites they can fall to 3-4 m in height. Ground cover is light. Despite the remarkable shared predominance of up to five species, there are still between 20 and 30 different species per hectare. The regeneration of these forests occurs by seed, sprouts and suckers. Brachystegia and Isoberlinia are in fact extremely invasive species that spread thanks to clearing or bush fires which open up other indigenous stands. - The Uapaca forests. Uapaca are small trees 10 m high at most. They are often mixed in the Brachystegia and Isoberlinia forests, where they complete admirably the community thanks to their dense (large leaves) fairly low, persistent or sub-persistent, crown cover and their creeping root system and their wonderful aptitude to sprout from the stump. On poor soils, Uapaca form often almost pure, closed stands without grass, with high content of humus in soils. * forests with undergrowth made up of Acacia dulcis and climbing Combretum thickets moving, as a result of fires and clearing, to open Burkea africana, Terminalia sericea, and Acacia giraffae forests. - Cryptosepalum pseudotaxus forests are low, but often dense stands covering only the sandy soils in the Kalahari to the west and north-west of Zambia. - Parinari forests are sometimes closed and sometimes very open stands found in isolated patches. Their distribution is highly fragmented. - Monotes forests can be found combined with Brachystegia and Isoberlinia stands, or as pure stands. - Burkea africana forests are mixed in many of the stands described above, but in places, they become dominant in the stands, particularly on deep and permeable sandy soil mixed with Baikiaea plurijuga in the region lying between Zambezi and the Okavango where the undergrowth is sparse and sometimes absent altogether. - Terminalia sericea forests cover the arid areas of the southern central plateau in the Brachystegia forest zone. Rather than being seen as open forests they might be considered savanna woodland. - the forests in the south-west of the miombo distribution area (the high plateaux in Angola) dominated by one Dipterocarpacea, Marquesia macroura. The present distribution of miombo forests discussed below, which is still largely unknown because of the recent degradation of these forests, has been provided by Kigomo (1995). Miombo forests cover a vast area in east and southern Africa between 4° N and 22° S (Map 3), and from sea level to an average altitude of 1 600 m in northern and western Zambia. These stands are widespread in the regions where annual rainfall is 600-1 200 mm, particularly in Katanga (the Democratic Republic of the Congo). With very few exceptions, rains fall in one single rainy season. These open woodlands are found frequently on particularly poor soils which have a surface water deficit. Miombos have been quite underpopulated for a long time because of the presence of the tsetse fly (Glossina). It is vitally important to maintain miombo forests not only for ecological reasons (erosion, micro-climate) but also for economic reasons: timber, fodder and non-wood products (large wild mammals, caterpillars, termites, wild fruit, mushrooms, medicinal products, etc.). Among these, the production of honey and wax is vital for the central-southern African populations. The genus Julbernardia is considered to produce top quality honey. - In the north-west of Zimbabwe, much of western Zambia, the north of Botswana and that of Namibia, and the south-east of Angola, these open woodlands give way on the Kalahari sandy soils to a formation dominated by Baikiaea plurijuga. - In Kenya, miombo forests are found on the southern coastal strip (Sokoke, Mida Creek, Mwachi and Shimba Hills forests) which are very largely dominated by Brachystegia spiciformis and Julbernardia magnistipulata. Manilkara zanzibarensis and Hymenaea verrucosa are commonly found in the Brachystegia open woodlands. - In Tanzania, where miombo forests occupy over 11 million ha, which is just over one-quarter of the total forest area of Tanzania (in 1973, Rodgers estimated that miombo forests covered over 50 percent of Tanzania, in: Celander, 1983), the dominant species are Brachystegia spiciformis, Julbernardia globiflora (namely about 80 percent of tree cover) associated with Combretum spp. and Pterocarpus angolensis. Dalbergia melanoxylon is frequent on the dry edges of the open woodlands. Annual rainfall ranges from 500 to over 1 000 mm, but is always under 1 500 mm, with a dry season running from November to June. Generally speaking, the miombo forests in Tanzania are on ferrallitic or ferruginous soils, which are comparatively poor, but with a level of fertility which is reasonably acceptable for agriculture (particularly the ferrisols). - In Zambia, the eastern plateau lies 1 200-1.850 m above sea level. In the north-west, the northern plateau peaks at about 1 500 m and then declines southwards towards the lower Zambezi Valley (1.300 m). The Kalahari region runs to the west and south-west (altitudes around 1.000 m). Rainfall, which is over 1.250 mm to the west, is 1.000 mm in the north, declining towards the south-west to about 600 mm (Kalahari). Generally speaking, the regions above 900 m in altitude are occupied by various forms of open Brachystegi-Julbernardia woodlands, particularly to the east. At lower altitudes other types of vegetation, including such species as Afrormosia, Pterocarpus, Combretum, Acacia and the mopane or mopani (Colophospermum mopane) become increasingly common. The centre of the eastern plateau supports a formation of Julbernardia paniculata-Brachystegia longifolia. - In the western region of Zambia, moving from north to south, ones passes through the Brachystegia woodlands and then Julbernardia-Brachystegia vegetation which gradually gives way to mixed forests, mainly of Brachystegia, Burkea, Copaifera and Baikiaea. The latter formation is dominated by B. hockii and such species as Burkea spp., Pterocarpus angolensis and Baikiaea plurijuga. Further south and south-west, the vegetation is dominated by Baikiaea, Copaifera, Pterocarpus and Ricinodendron rautanenii. - In Malawi, miombo forests cover 17 percent of the whole country. The mountains and valleys break up the uniformity of the vegetation, with the result that the open woodlands in Malawi are not as extensive as in Zambia and Tanzania. The plateau around Blantyre-Zomba, in the south, is covered with Brachystegia-Uapaca-Cussonia formations. To the north, between 1 500 and 1 850 m the rainfall is more substantial, ranging 750-1 275 mm. The miombo forests south of Lilongwe have been widely harvested. Altitude determines the numerous other associations that are too many to describe in detail here. Most of the open woodlands have been, and are still being, overharvested to provide fuelwood for domestic and industrial (a tobacco-drying plant) uses. - In Zimbabwe, Brachystegia spiciformis miombos cover the Veld (high plateau) 1 450-1.680 m (south of Harare) where the annual rainfall is around 1.150 mm. At its lower limits, this formation gradually gives way to a Brachystegia boehmii type. This one is more commonly found in the north-east and south-west of the country, roughly 1.375-1.450 m. At a lower altitude this type of formation gives way on sandy soils to the association Burkea africana-Terminalia sericea and on clay soils at lower altitudes to Acacia savannas. The dry Baikiaea plurijuga formation is found in the north and north-west of the country. The other species associated with this dry forest are, inter alia, Burkea africana, Guibourtia coleosperma, Terminalia sericea, Ricinodendron rautanenii, Pterocarpus angolensis and Acacia spp. In the south, approximately 900-1 100 m, with annual rainfall ranging between 250-650 mm, the mopane open woodlands dominated by Colophospermum are the most common. In the Sabi and Limpopo Valleys, the mopane canopy is not continuous and gives way to savanna woodland. - In Mozambique, scientific data on miombo forests are more rare. 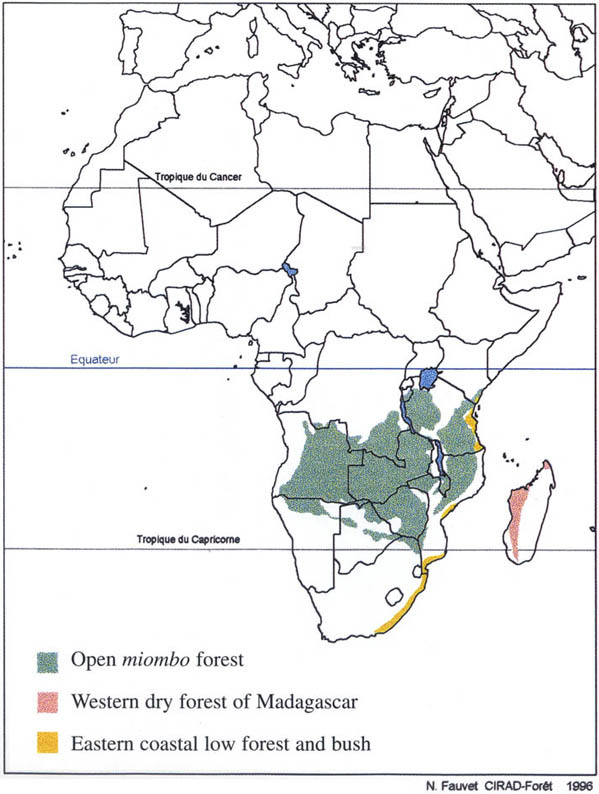 In 1952, two-thirds of the country were covered by Brachystegia-Pseudoberlinia open woodland, which constitutes the extension of the miombo forests in south-east Tanzania. The most abounding species are Brachystegia spiciformis, B. bussei and B. woodiana. Between 600 and 900 m, the Brachystegia-Uapaca open woodlands are most frequent, and at the foothills this formation gives way to an association of Combretum, Terminalia and Protea. Vegetation in the Zambezi Valley corresponds to an extension of mopane beginning in the south of Zimbabwe with dominant species of the genera Commiphora, Afzelia, Kirkia, Sterculia, Albizia, Combretum, Diospyros, Tamarindus and Ziziphus jujuba. It should be pointed out that today, also in Mozambique, formations such as mopane and miombo forests are becoming increasingly degraded in order to meet the needs of agriculture and to supply fuelwood. The primary dry closed forests on the west coast of Madagascar, between sea level and 800 m are characterized by a vertical structure with three strata, and often by the absence of grass cover. The understorey, ranging from 1 and 5 m in height, is very dense, with 2 000-10 000 stems per ha. The vast majority of its constituents are evergreens. The middle storey is six to 12 m in height, and varies in density between 500-2 000 stems per ha. Most of the species are evergreen. The dominant storey is very variable. It can reach as high as 30 m in the most favourable sites, but on average does not exceed 15 to 20 m, with 10 to 50 trees per ha. They are mostly broadleaf species. The variations around this typical structure depend on water availability and ground water reserves. In the more fertile parts, the dominant storey is continuous and comprises numerous species which retain their leaves throughout the year, while in the drier parts the structure is reduced to a layer of stunted trees and substantial grass cover. - A dry tropical climate with two pronounced seasons: a hot rainy season, lasting from three to five months from November to March, and a dry season from seven to nine months, from April to October. Mean annual rainfall varies form 500 mm in the south and 1 000 mm in the north (Donque, 1975. Rainfall increases as one moves further from the sea. Rainfall varies sharply from one year to the next and within the same year. Mean annual temperatures are 20-25°C, with temperature variations rising southwards and towards the interior from the coast. The absolute maximum exceed 40°C while the minimum drops to 7-8°C in July-August (Blaser, 1991). - The soils in primary forests: varying widely depending upon the parent rock. Generally speaking, they have a slightly acidic to neutral pH, good and rapid mineralization of organic matter, but low chemical reserves (Sourdat, 1977; Felber, 1984; Randriamboavonjy and Bourgeat, 1993). It is their water reserves, which depend on the texture and the structure, that differentiate them the most. Two main types of dry deciduous forest can be distinguished according to soil types (Koechlin et al., 1974): forests on alluvial soils and along the waterways; and dry deciduous forests on clay or sandy soils and limestone plateaux. The first type of forests are found along the waterways and in the alluvial plains. They are most extensive near the river mouths or the areas of confluence. They are very similar in form to moist forests, with a large proportion of tall evergreen trees. Many of the alluvial forests have been cleared because the edaphic conditions are the best along the west coast for irrigated rice farming or for dry-cropping such difficult crops as cotton, truck gardening crops (tomatoes, onions) cape peas, maize and sweet potato. The second type of forests, which are more characteristic of the dry deciduous forests, are divided into three sub-types depending upon the geological substrate. The sub-types standing on clay or limestone plateaux are mainly found in the northern part along the west coast: the Ankarafantsy forest; and the forests in the Antsohihy region. The sandy soil sub-type dominates along the central and southern coastal plains, from Maintirano to Morombe. The dry deciduous forests on clay, sandy soils and limestone plateaux have been cleared, particularly over the past 30 years using the shifting cultivation system. The cleared lands are often used for farming maize, cassava or ground nuts for between one and three years before being left fallow. These fallow lands are rarely farmed again, for the time being. Some species of the dominant storey reach remarkable dimensions, such as the baobabs (Adansonia grandidieri, A. fony, A. za) and Madagascar rosewood (Dalbergia spp. ), ramy (Canarium madagascariensis), farafatsy (Givotia madagascariensis), hazomalany (Hernandia voyroni), Khaya madagascariensis, etc. There is a wide botanical diversity (between 100 and 200 species per ha). No recent evaluation of the size of the extension of these forest stands has been carried out. However, they must cover some million hectares in the case of the forests that are only slightly or not at all degraded, of which about one-fifth can be logged, and a further million hectares are covered by secondary forests (Deleporte, 1995). The altitude varies between 0 and 800 m, and the relief is generally fairly light except around the edges of the plateaux. The most extensive formations are the caatinga and the cerrado, mainly in Brazil, which explains their well-known Portuguese name. These are generic terms. The cerrado is a densely shrubby savanna woodland (sabana arborea, sabana arbolada in Spanish). The expression campo cerrado is strictly used for savanna woodland where the tree stands are open or very open (sabana abierta, sabana arbustiva in Spanish). Caatinga refers to a steppe or thicket (chaparral in Spanish). In the case of closed woodland patterns the expression used is caatinga agrupada (matorral). 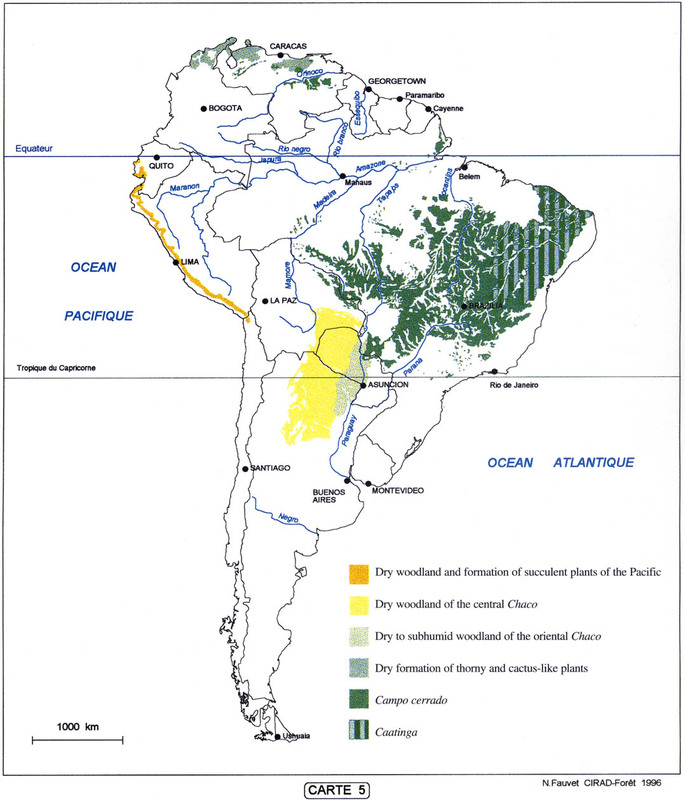 Chaco designates the central plain, which covers more than 1 million km2 between Argentina, Paraguay and Bolivia, and also Brazil (the Brazilian Chaco is not very extensive and follows on from the cerrado). It comprises several types of vegetation of which the most important, Chaco seco is a dry forest with different patterns (detailed below). Particularly in Mexico and Central America there are many dry deciduous forests (corresponding to the African dry deciduous forests or the open woodlands), which are often fairly small in extension and are seriously degraded. For example, all along the Pacific coast from Mexico to Costa Rica one finds the Selva baja cadudifolia, or the low deciduous forest in a dry climate (rainfall: 800 mm/year and 7-8 dry months). Bursera simarouba is quite common there, together with Guaiacum sanctum. The trees are generally short and twisted, with branches close to the base: the classic degradation patterns. Some very valuable trees come from these stands: Bombacopsis quinatum; Samanea saman; and Enterolobium cyclocarpum. Lastly, the dry semi-deciduous forests covering fairly small areas, are found in the heart of the Amazonian Basin (for example on the banks of the Tapajoz near Santarem), characterized by Sclerolobium paniculatum and Vochysiacea (Aubréville, 1958). In Brazil, the caatingas zone lies between 3° and 15° S, 34° and 45° W. The climate has two different rainfall regimes. In the north and centre the rainfall depends on the movement of the intertropical convergence zone while the southern rainfall is under the influence of the cold fronts coming from the south. These two regimes induce different dates for the beginning of the rainy season, and account for the sharp variability in rainfall, ranging from 400-800 mm. An initial effect of the droughts, particularly when they are prolonged, is the reduction in the protection of the soil, an increase in water runoff and a reduction in water seepage and in the water reserves available to the plants. There are several types of caatingas, which are generally described as a dwarfed vegetation formation, deciduous in the dry period, comprising many different types of cactus and thorn-bushes which are perfectly suited to drought conditions. Even though they are deciduous, most of the species do not lose their leaves except when they can no longer meet their vital needs. This explains why the caatingas can stay green throughout most of the year if there is sufficient rainfall and if it is well distributed. Even though the grass cover is considered to be negligible, in a year with surplus rainfall, the grass can grow explosively and suddenly disappear for several years. This regeneration possibility of the caatingas, means that they can recover perfectly well, within a few years, from the damage caused by climatic changes and from over-use and overgrazing by man and his livestock respectively. According to Campello (1995) the dominant species are: Anadenanthera macrocarpa, Astronium urundeuva, Cassia spp., Caesalpinia pyramidalis, Bursera leptophloeos, Tabebuia spp., Ziziphus joazeiro, Pithecolobium dumosum, Mimosa hostilis, Croton sonderianus, Combretum leprosum, Bauhinia forficata, Aspidosperma pyrifolia and Mimosa caesalpiniafolia. In Brazil, the expression cerrado refers to open woodland or savanna woodland, while campo cerrado refers to poor savanna woodland or shrub savanna. The cerrado (sabana abierta) is a mixed tree formation, 10-15 m high with an understorey of shrubs and grass. The campo cerrado is the result of the degradation of the cerrado. It has a similar flora composition, but a classic shrub appearance with a few small trees (5-7 m high). The typical climatic features of the cerrados are an annual rainfall between 1.000 and 2.000 mm, concentrated in 6-7 months, in a single season. This is the typical tropical climate with heavy summer rainfall followed by a severe dry season. These formations are semi-deciduous (various highly degraded forms of thickets are exceptionally completely deciduous) and they are found above all in Brazil (Map 5) in the States of Goias, Minas Gerais and São Paulo. The cerrado is a very different plant formation than the steppes and thickets on the caatinga. A comparison of the main ecological features that differentiate the cerrado from the caatinga is given in Table 4. Because of its extension, the Chaco comprises many different types of vegetation, from lush forest to dry forest, savanna and swamplands. Particular emphasis will be given here to the Chaco seco, a landscape of xeromorphic forests in the north and west of Paraguay. In the centre, the ecosystem gives way to Chaco humedo, which is a forest-savanna-palm grove mosaic, lying between the Pilcomayo River and the Paraguay River. The Chaco seco region suffers from a very severe water deficit, with annual rainfall ranging between 400 and 800 mm. The rains are extremely variable, because in the space of 24 hours it is possible for the equivalent of six months rainfall. It is the water distribution that mainly determines the types of vegetation. The Chaco forests are comparable to low, thorny and difficult to penetrate woody savannas. The plant cover is very dense except in the humid and sandy areas where it is more open. The forests have a tree layer, 8-12 m high, a bush stratum 3-8 m high and a poorer understorey. The trees and bushes generally bloom in the rainy season (September-November) and complete their reproductive cycle April-June (winter drought). Some species are deciduous in winter (Ruprechtia triflora) while others are evergreen (Aspidosperma quebracho-blanco). The grasses develop during the summer rains and their reproductive cycle takes six to nine weeks. The irregularity of the summer rainfall makes it possible to achieve a variety of different vegetative and reproductive cycles in one and the same site. * The xeromorphic forest (Quebrachal of Aspidosperma quebracho-blanco), a climax formation which covers most of the dry Chaco, with the layers described above whose main species are: Aspidosperma quebracho-blanco, Chorisia insignis, Cereus stenogonus, Stetsonia coryne, Schinopsis quebrcho-colorado, Castela coccinea, Prosopis kuntzei, Bulnesia sarmientoi, Cercidium praecox, Capparis tweediana, C. retusa, C. speciosa, Bougainvillea praecox, Ziziphus mistol, Caesalpinia paraguariensis, ... (Spichiger et al., 1991). * The xeromorphic thicket (Matorral xeromorfico), which is an impoverished formation derived from the xeromorphic forest. It is characterized by the absence of a tree stratum and an average height ranging between 4-8 m. These are often renewal stands on dried-up river beds, in zones with temporary watercourses. The main species are similar to those found in xeromorphic forests, but they are lower and the dominant species are Ruprechtia triflora, Bromelia spp. and Capparis spp. * The xero-hygrophile thicket (Matorral xerohigrofilo) on clay/silty soils or clayey, which are subject to temporary and often brackish flooding, is frequently found in minor riverbeds. The labon (Tabebuia nodosa) blooms just before the rains. In India, as in other countries in the region, the monsoons beat against the main hills and generates bio-climates with fairly plentiful rainfall, and a fairly long dry season. The western Ghats and the coasts receive the most rainfall. The Deccan Plateau in the south-eastern plains in the Indian peninsula protected by the Ghats undergo fairly long droughts (Map 6). The following presentation has been based very largely on La végétation de lInde, Ecologie et Flore, by Legris (1963). Dry deciduous forests cover vast areas of central and peninsular India. They are distributed virtually throughout the whole of the Deccan Plateau. Their extreme limits are the 8th and the 32nd parallels. In such a vast region, the climate is obviously not uniform. Even though there are many types of transitions, the main series are floristically distinct and belong each to a well determined bio-climatic range. They share numerous characteristic species and a certain similarity in their state of degradation. There are three series which are: the Shorea robusta; the Tectona grandis; and the Hardwickia binata series. This series covers the north-east of the Deccan Plateau, the Bihar and the Siwalik region. The forests are moderately dense, closed, of average height (20 m) with only one intermediate stratum ranging from 10-15 m in height, sometimes plentiful with bamboo (Dendrocalamus). The sal (Shorea robusta) series gives way to the teak series, extending beyond the borderline of the areas of both species. There is virtually no mixing between the two species, since the ecology of the Tectona grandis is drier as a whole than the sal ecology. Further south, the teak series in contact with the Albizia amara series on the Madras plain. Whether or not this is a distinct series is a matter of debate. It is actually a transition between the previous series and the thorny series of the Deccan Plateau. Its ecology, of either bio-climatic or edaphic origin is dry as a whole. The stands are rarely dense. Its scattered distribution is very largely due to biotic factors. Hardwickia binata becomes dominant in a type of forest common in Andhra Pradesh where there is no teak (particularly the districts of Chittoor, Cuddapah and Kurnool). It is a two-layer forest composed of one strata about 20 m high, almost exclusively made up of Hardwickia, which emerges from a layer about 15 m high, made up of common species of the deciduous dry series. The edaphic patterns are the result of the comparative abundance of a few species, which are found locally within an altogether homogeneous stand. For example, the Santalum album pattern deserves special mention here. Sandalwood (including the roots) is used because of its high content of essential oils, and is a small tree that grows extremely slowly. Its distribution area is limited. It is found plentifully in the northern part of the State of Madras and in Mysore. It is at its best between 600 and 1.200 m in the deciduous dry series. The dynamism of the deciduous dry series that has just been presented here is very largely conditioned by the drought of their respective environments. The sal series is found in a more humid environment than the other two. Conversely, the teak series is found mixed with drier formations of Hardwickia and Acacia, but occupies the better sites. All three are heliophilous, savanna fire-enduring, and sprout well from the stumps. Shorea robusta, which demands a great deal of light, can endure shade in the first stages of development. It is essentially a gregarious species which rapidly colonizes forest clearings. Teak demands full light, and does not tolerate shade in the first stages of development. This species only takes root on well-drained soil. Its resistance to heat and drought is greater than that of the Shorea robusta. It can thrive even in such dry climates as those that surround Rajasthan. The stands are open, the trees are stunted, but teak accounts for over 50 percent of the crown cover. It does not have the same colonizing power as Shorea robusta. In very dry climates it seems more suitable to self-maintenance than to propagation. Hardwickia binata is an evergreen species with light crown cover, perfectly suitable for drought, adapted to fire, and resistant to most disturbances. Its deep tap roots enables it to exploit the groundwater reserves. It can regenerate even on soils that have been compacted by livestock. It is found more frequently on very superficial or skeletal soils. The dominance of this species in very dry formations in the Deccan Plateau is also due to its aptitude to sprout from stumps and the facility for young plants to recover even after fire damage. These stands are open, ranging from low forest to desert steppe. They are found in all the very dry and semi-arid regions in India, from the extreme south-east of the peninsula along the semi-arid strip of the Deccan Plateau leeward of the Ghats to Rajasthan to the valleys of the Ganges and the Indus. Despite some floristic and ecological differences, the stands in this group share the following common features: xerophilous vegetation, predominantly thorny, very dry semi-arid or arid climates, generally eroded soils, poor in nutrients or physiologically dry, highly influenced by biotic degradation factors. Some thorn-bush stands are probably replacement series that currently occupy former area of the more humid series. The flora is quite poor, xerophilous, with many ubiquitous species that exist throughout the dry zone towards the east or the south, particularly in the arid and semi-arid areas of Rajasthan. A few rare species, Albizia amara, Anogeissus pendula, Prosopis spicigera and Calligonum polygonoides, limited to small areas or dominant in certain types of vegetation, may be selected as typical. - Acacia stands in the Ganges plain.